September | 2016 | Syed Jahanzaib Personal Blog to Share Knowledge ! 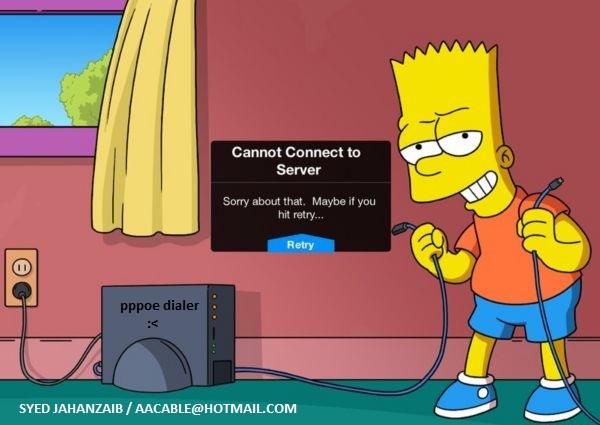 This post contains short notes on HOW-TO add simple pptp based VPN server in Ubuntu. 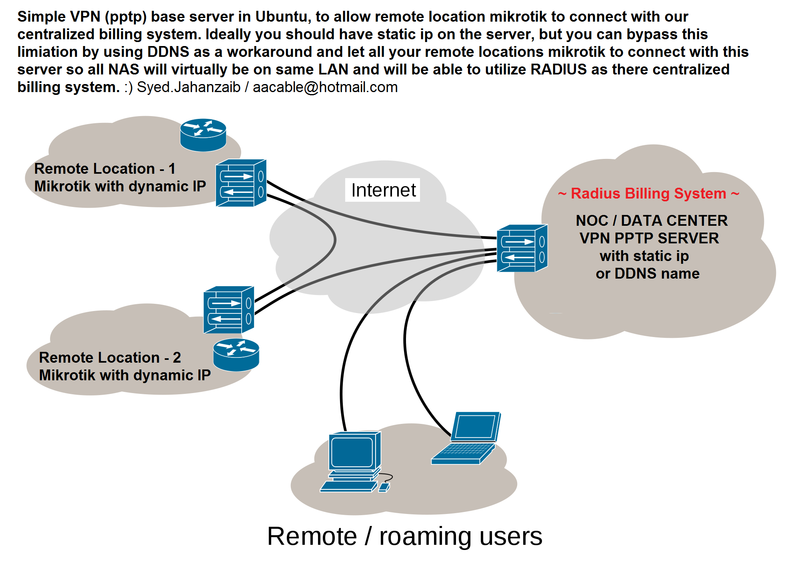 It it useful in many scenarios example if you have Linux server in the office, and want to connect to it from anywhere in the world. OR you can use it in a situation where you want your billing server to act like a centralized billing system for all the remote locations NAS. 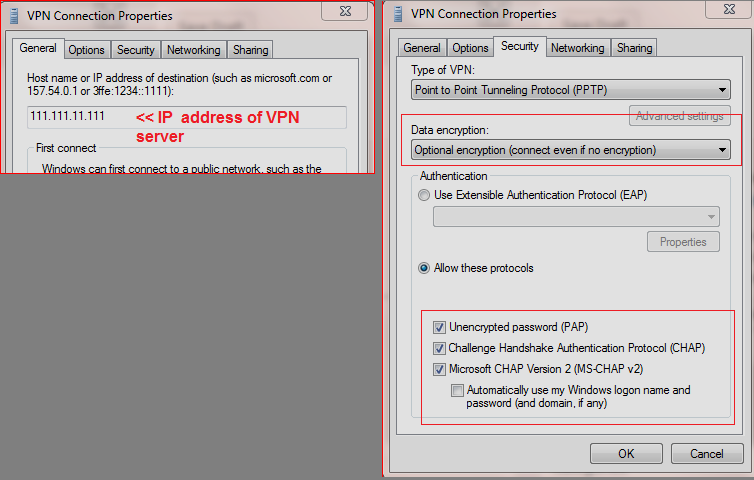 Ideally you should have static Public IP on this vpn server, but you can bypass this requirement by adding an DDNS name as well as a workaround like changeip.com. 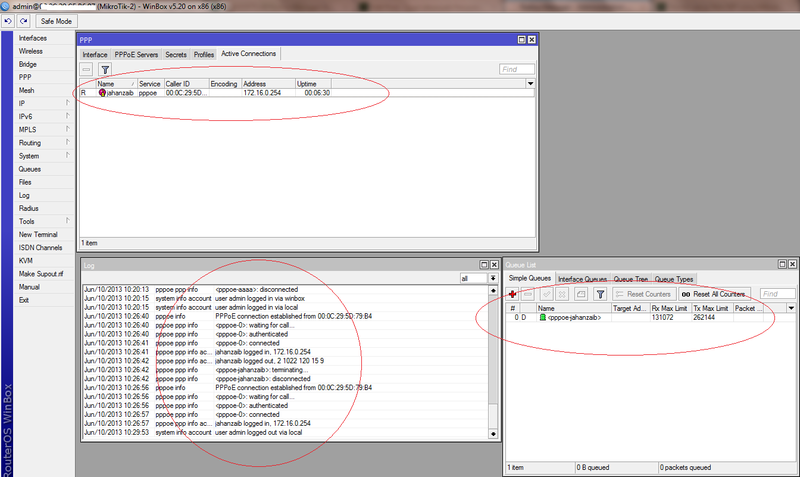 I remember that I did similar configuration at some philippine network and one at cloud. 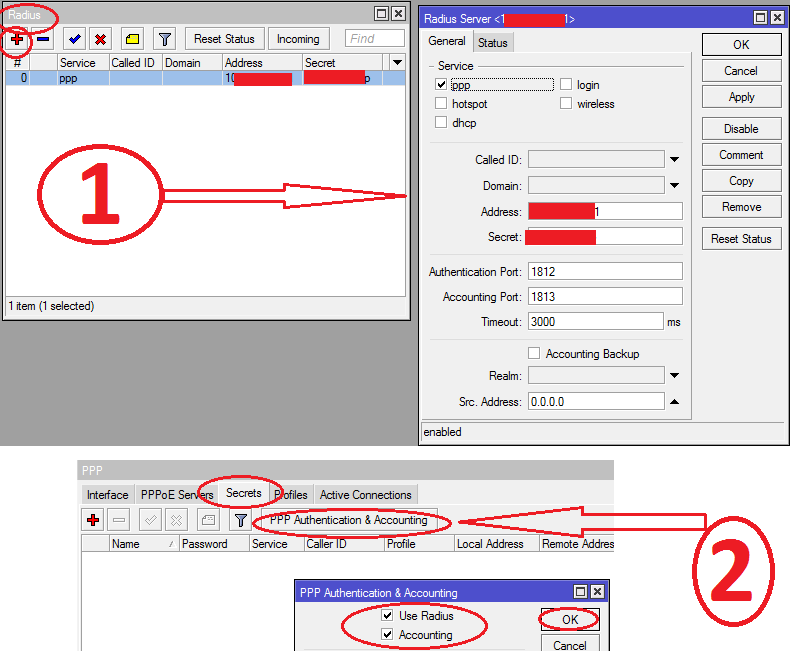 Now Issue following to add vpn server options like local/remote ip addresses. I used echo command to directly insert text/data into the config files rather than editing by nano/vim. use whatever is easier for you. If you see it’s running, our Server End is probably OK.
Sep 27 04:15:22 radius pptpd: CTRL: I wrote 156 bytes to the client. Sep 27 04:15:22 radius pptpd: CTRL: I wrote 32 bytes to the client. Sep 27 04:15:22 radius pppd: Plugin /usr/lib/pptpd/pptpd-logwtmp.so loaded. Sep 27 04:15:22 radius pptpd: GRE: Bad checksum from pppd. Sep 27 04:15:52 radius pptpd: CTRL: I wrote 20 bytes to the client. Before Proceeding further, read the following links for Kannel Installation and configure SLQBOX. 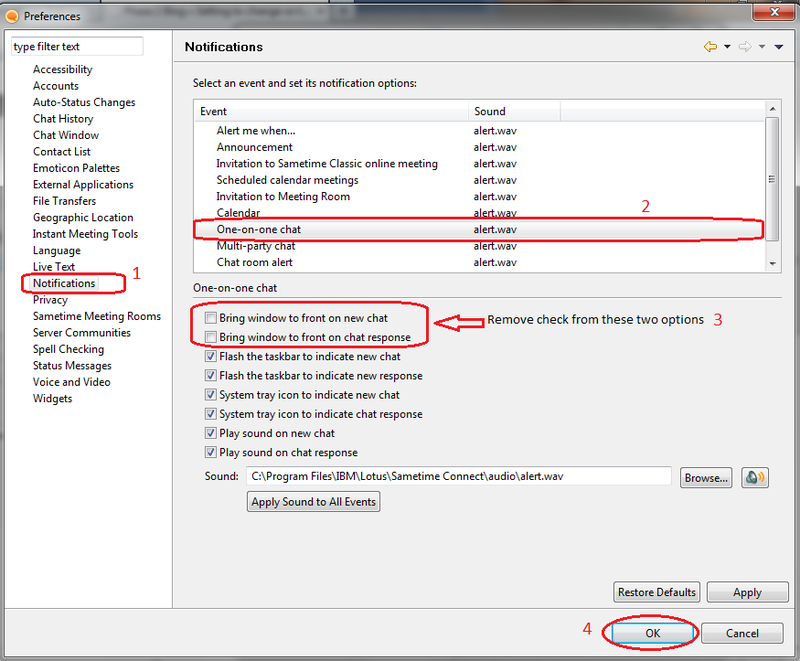 This is just for reference purposes of DOABLE things, and by no means it should be deployed in production environment. These are just short references, and must be modified according to the safety standards. Currently we are using KANNEL as SMS gateway to send messages to users,admins about various events and information. This SMS Gateway is used by the Linux , Mikrotik Router, and windows base systems. But the problem is that using standard kannel HTTP submission method, we cannot track any message and its status. Its like blind system. And recently it was asked by few OP to track the Sent sms Numbers, status for a particular given time or over all month report. C:\wget\wget.exe  "http://192.168.0.1:13013/cgi-bin/sendsms?username=kannel&password=KANNELPASS&to=03333021909&text=INFO: [TimeAndDate] UPS is working on KESC now"
The scheduled bash script runs on Linux base billing system which submits various messages to users like account expiry, password change info, etc via submitting messages with destination numbers using CURL. For this purpose we made simple PHP page that can be called from any remote system and will act using the provided url parameters. thanks to mr tapan.kumar for providing sample php page for this purpose. 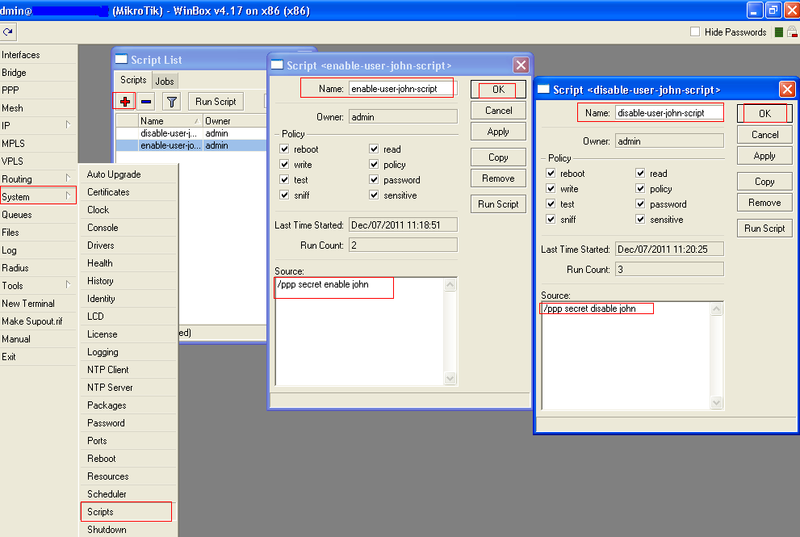 Example of CURL/BASH script which fetch data from mysql table for logged in alert for manager/admin into panel. You have successfully logged-in to billing admin panel. curl -G "http://$KANNELURL/test.php?sender=php&to=$MOBILE" --data-urlencode "message=$MSG"
When the curl will call test.php , it will simply enter the data into SND DB. This way we can have a centralized SMS submission system , which will keep track of every SENT sms with the details we require according the local need. It can be modified as per the requirements. These are just my findings from Google and tips with some working sample code from few resources.